The U.S. Capitol on Monday as a partial government shutdown stretches into its second week. A high-stakes move to reopen the government will be the first big battle between the incoming Democratic House majority and President Trump. President Trump on Friday issued an executive order freezing the salary rates for federal workers. 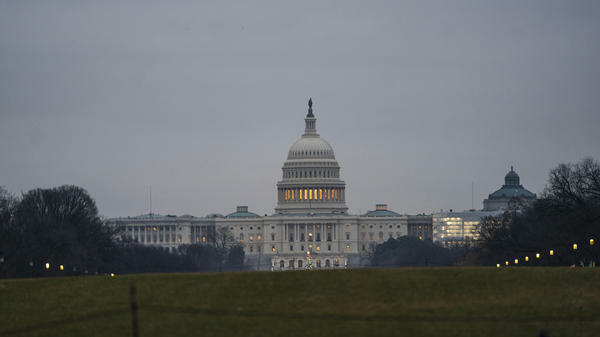 The order wasn't a surprise but for some 800,000 federal employees furloughed during the partial government shutdown or working without pay, it was like rubbing salt into a wound. The president had been telegraphing his plans for a pay freeze for almost a year — first in his annual budget and again last summer in a letter to Congress. Trump pointed to the government's dire fiscal situation. Thanks to tax cuts and increased spending, the deficit has ballooned to more than a trillion dollars this year. Trump's order only applies to civilian workers. Military personnel, who are covered under a separate funding measure, will receive a 2.6 percent raise. Jacqueline Simon of the American Federation of Government Employees, the largest federal workers union, tells NPR that "the military deserve their pay increase, and we're strongly in favor of it. And, in fact, for many, many years — decades, even — there was parity between the civilian and the military workforces in terms of their pay adjustments." For the last two years, though, paychecks for civilian government workers have grown more slowly than those in the military. And the president's pay freeze would widen that gap if it stands. Federal workers shouldn't give up hope — there is a chance they could get a raise. The Senate has already OK'd a pay raise for federal workers of 1.9 percent. And the new Democratic House is expected to follow suit. The president would have to sign the measure. The Washington Post reports: "Federal employee pay raises are effective at the start of the first full biweekly pay period in the new year, which in this case will start Jan. 6. There will not be much time for enactment of a raise by then, but raises have been paid retroactively — most recently in 2003 and 2004, when agency funding also hadn't been resolved until after the start of the new year. In both cases, a raise had been paid by default in early January but was overridden by a larger one contained in a full-year appropriations bill."